We welcome the Class of 2020 with great enthusiasm for what our shared future holds. With about 5,000 visitors a day, the HSU Library serves as the campus learning-center of choice. As the Library undergoes Seismic Retrofit Project renovations, the Class of 2020 will witness not only the transformation of Library structures, but also of their learning experiences within them. 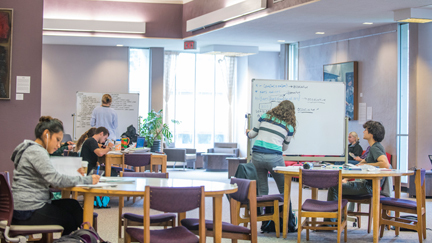 The HSU Library joins and leads the evolution of university libraries to support research and scholarship with collaborative workspaces, access to equipment and technology, digital publishing, internships, workshops, and a variety of services. Building creative learning environments and curating meaningful experiences is essential to student success and for a sustainable intellectual and entrepreneurial culture. Our current and future Student Centered Spaces provide state-of-the-art educational opportunities to learn, share, and innovate as a campus community. 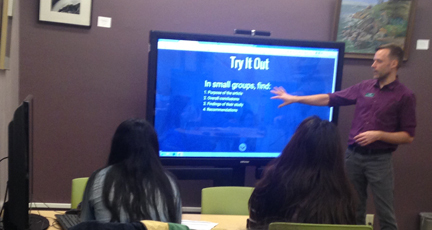 Here at the HSU Library, students do more than access information online - they create it. That is our library of the future. 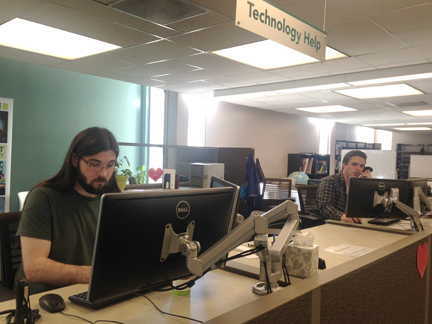 Third Floor: Addition of 20 new group study areas by relocating ½ print journals to basement. Click here to see the HSU Library Renovation and Seismic Retrofit Timeline. To learn more about HSU’s Library of the Future, go to Student Centered Spaces and the HSU Library Seismic Retrofit Project. For ways to support HSU’s Library of the Future, go to Giving to the HSU Library.